The day has finally come! Over 15,000 joined the live stream of our biggest announcements and vision, and the feedback has been overwhelmingly positive! Thank you to all who attended the event, interacted on social media, and participated in the online chat session; it’s been a busy day! Let’s recap the announcements and key takeaways of this important event! Replay the virtual event: You can replay the online event, along with key announcement breakouts and new technology previews, here. Additionally, here is the official press release of today’s news. More features for Veeam Availability Suite 9.5: This set of announcements for Veeam Availability Suite 9.5 (due to be available in Q4) deliver scalability and performance enhancements, including backup acceleration technologies, full VM restore acceleration technologies and key processing engine enhancements. Additionally, a key feature in new Advanced ReFS Integration will greatly improve performance and capacity efficiencies for backup repositories, and Veeam ONE 9.5 will bring new chargeback capabilities. Veeam Agent for Microsoft Windows and Veeam Agent for Linux: Veeam Endpoint Backup FREE and Veeam Agent for Linux (Formerly Veeam Backup for Linux) are now both collectively known as the Veeam Agents. With Veeam agents, Availability can be delivered to Windows-based endpoints and Linux instances running in the cloud or on premises with simple backups and flexible recovery options. There will be free editions, plus workstation and server licenses. The Veeam Availability Console: Formerly the Veeam Managed Backup Portal, the Veeam Availability Console will be an easier way to consume backup services and disaster recovery (DR) services for both the service provider and the enterprise IT organization. Veeam Backup for Microsoft Office 365: As one of the most popular requests, this new capability will allow organizations to mitigate the risk of losing email data and ensure Availability to users by securely backing up your Office 365 email data to a separate, on-premises location. Veeam Availability Orchestrator: We’ve kept the details of this newly announced product pretty close. 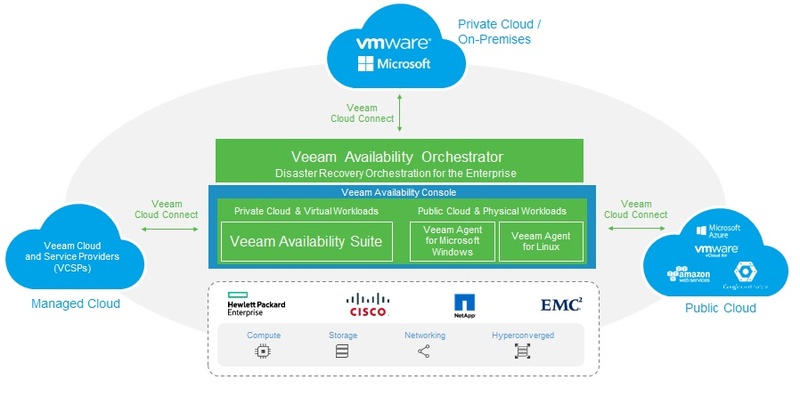 Veeam Availability Orchestrator is designed to provide enterprises a multi-hypervisor DR orchestration engine to easily execute, test and document disaster recovery (DR) plans. Here are more of the Veeam Availability Orchestrator specifics. Sneak peek at Veeam Availability Suite v10: The next release of Veeam Availability Suite will launch next year; but we’ve used this event to give you a sneak peek into the first announcement of v10 — look forward to an integration with IBM SAN Volume Controller (SVC) and the IBM Storwize family. Much more information on v10 coming at VeeamON in May of 2017! There is more to come: The best way to find out what else Veeam has in store is to join us in New Orleans for VeeamON 2017. See this new vision come to life with new products and experience Availability for yourself. Experience Availability – Happy World Availability Day!